Fans of popular science, read the highlights of the Royal Society of London’s first 350 years. Scientists, or anyone really, try the original 300-odd year-old manuscripts. It’s not that often than a newspaper article alerts me to a science website that’s worth exploring. The Royal Society’s Trailblazing website gives a time-line of major scientific news, with illustrations and short summaries as well access to the original accounts in Philosophical Transactions for history buffs and geeks. There’s a wide range of fun to be had: observations after restoring a 14 year-old boy’s sight, smallpox vaccination (Sir Hans Sloane is also credited with inventing milk chocolate), testing young Mozart’s skills, a comet discovered by Caroline Herschel in 1794 (the first officially recognised woman scientist), a proof that fingerprints are unique, Barbara McClintock’s “jumping genes” (transposons), the first atomic explosion, continental drift, black holes, and edge detection for recognising visual objects are some of the many topics covered. In 1775 Charles Blagden, Secretary of the Royal Society, entered a room heated by a furnace to at least 260°F (around 127°C). At this temperature the ‘greatest part of a beefsteak was pretty well done in 13 minutes’ and eggs that were removed after 20 minutes were found to be ‘roasted quite hard’. Yet Dr Blagden and his colleagues were unharmed by an 8-minute exposure and their core temperature did not change. Furthermore, their dog, wrapped in a blanket to protect its feet from burning on the floor, remained there for 30 minutes and was ‘little so affected during the whole time as to show signs of pleasure whenever we approached the basket’. Blagden and colleagues showed that the reason humans and dogs are able to survive such heat is owing to evaporative cooling, either from sweating, as in the case of humans, or from panting, as in the case of the dog. Frances Ashcroft, University of Oxford. New Zealanders will be happy to see that James Cook and Ernst Rutherford are represented. Mathematicians have their fair share, too. The final article is on today’s hot topic, ideas to battle global warming. Each article has links to further information, they’re worth following. A while back I worried about losing “old science” through not bringing the back catalogue to the digital era. I have to say this is impressive. These old manuscripts are great to read! They’re scanned, so you read them in the original typesetting, complete with the Old English f for s, y for j and so on. 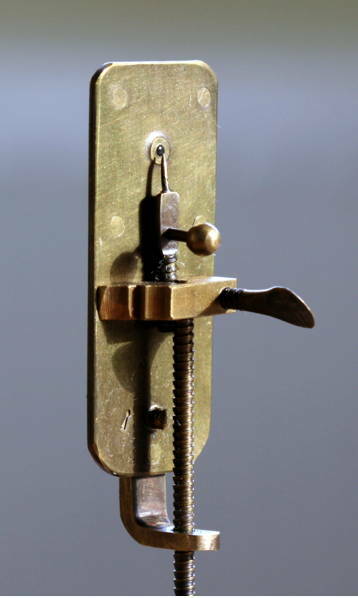 Antonie van Leeuwenhoek is famous for his microscopes and the observations he made using them. As you can see above, his microscopes are basically a small (round) lens mounted in a metal plate, with a pin on which the subject being observed was placed. He writes to the Royal Society reporting looking at little drops of water. The “little animals” he observed here are bacteria and protozoa. van Leeuwenhoek was the first to describe microorganisms and this paper I would think is the first report of them in English. The language of science has moved on a little since then…! I’m guessing that the “two little horns” are flagella of a biflagellate species. Protozoans are also a recurring topic in Gary Larsen’s Far Side cartoons. They’re the squiggly blobs, often with glasses. How many of you as a kid played with a microscope, staining blobs of water and twiddling little knobs? 1. There’s a difference between f and Å¿, apparently. Old English isn’t my field… In the later, the horizontal bar is only on the left side of the character, not right through it as it is in ‘f’. 2. My reference to ‘vaccination’ should read ‘inoculation’; the early efforts were with inoculating with a small sample containing smallpox, as opposed to vaccination via cowpox, which came later.